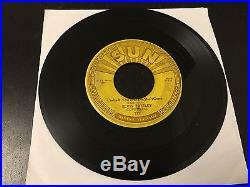 ELVIS PRESLEY ORIGINAL SUN RECORDS BABY LETS PLAY HOUSE 45 RPM, SUN 217, 1955. ELVIS PRESLEY Baby Let's Play House. Extremely rare 1955 US wide centred 7 vinyl single, also including I'm Left, You're Right, She's Gone. The rarity & legendary collectability of the early Elvis Sun singles is well known and needs no further explanation here. This 7 was pressed in Memphis by Plastic Products as part of a batch run of probably as little as five hundred. The way to tell this is by evidence of three locating circular pressing lugs that can be seen and felt under the label. All Elvis Sun singles that were pressed in Memphis have these marks, which were impressions from the master stamper alignment lugs. If a single needed to be pressed in greater quantities when it became a local or national hit, then the pressings were sent away to other plants, normally the big ones in Los Angeles. These copies do not have the three impressions under the label but are still original Sun issues. So, without the impressions under the label, it. With the impressions under the label, it. The lugs are clearly present on this copy. The labels themselves are in good condition, with a little wear and an original shop sticker on one side. All the text is still clear & sharp. The matrices are hand scratched into the run off area. The vinyl has a lot of light surface hairlines. The final clincher to the certainty of this being an original Sun single and not a counterfeit or seventies re-issue is the presence of the famous. In 1955, over sixty years ago, the Memphis plant was then normally issuing singles in 10" 78RPM Shellac, but had just started to introduce the new 7" vinyl discs that were beginning to become popular. They did this for their new singer, Elvis, and this was his fourth single for them, recorded in February 1955. As they re-tooled some presses to cater for the new 7 format, the cutting lathes were left at the 78RPM stylus width. 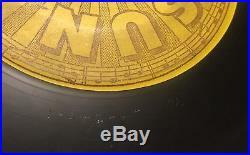 The vinyl that they used was not the sort of quality and purity that we have come to expect today, in fact Sun used quite poor quality vinyl and were pressed with a groove width designed to handle the thicker 78RPM stylus, as compared to the thinner Microgroove needle that was introduced with the LP format. Thus, if you play this on modern equipment, with a smaller stylus radius, you get a degree of surface noise that has become known as the'Sun Hiss'. The re-presses and counterfeits, being cut with a modern cutting lathe, do not have this tell tale characteristic surface noise. An Elvis Sun original from 1955, pressed in Memphis as part of a batch of five hundred or so at Plastic Products on Chelsea Avenue. Visually, there is a little wear and it looks to have been played quite a few times. Sonically, it will not represent what you would expect from a modern pressing, as the plant was still geared up for their main product, the 78. Then again, that's how you can tell it's the real deal. 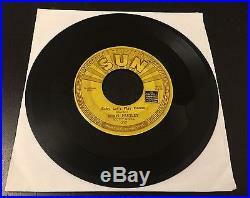 Elvis' fourth Sun single, pressed in Memphis itself, in VG / VG+ condition. 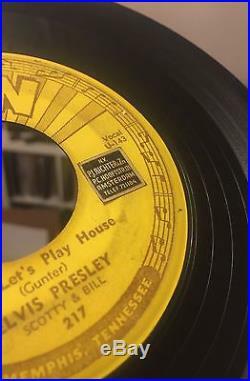 The item "ELVIS PRESLEY ORIGINAL SUN RECORDS BABY LETS PLAY HOUSE 45 RPM, SUN 217, 1955" is in sale since Monday, December 04, 2017. This item is in the category "Music\Records\Albums/ LPs\Rock\Classic". The seller is "terence_moon" and is located in Newcastle, Tyne and Wear. This item can be shipped worldwide.